Cook onions and green pepper in an oiled skillet over medium high heat until tender; set aside. In same skillet, brown meat; drain fat. Mix in seasonings and water. Bring mixture to boil; reduce heat to low and cook uncovered for 5 minutes. Return onions and bell peppers to skillet; add tomatoes. Heat through and serve with warmed tortillas. 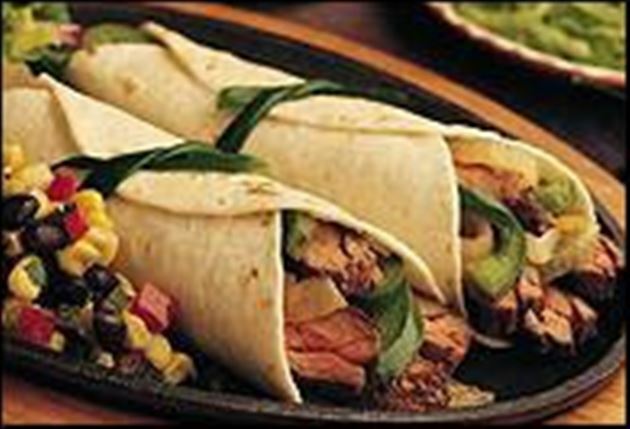 Cinco de Mayo Fajitas Mexican recipe from MexGrocer.com! On May 5th, many cities of the US are alive with color, laughter and dancing. Millions of Mexicans and Americans of Mexican origin are celebrating Cinco de Mayo or the Fifth of May. It is an occasion which Mexicans and Americans share to emphasize the friendship between their two countries. The holiday originated with a surprising battle. In 1861, France, England and Spain sent ships to Mexico to settle a debt. Within a few months, an agreement was reached and the British and Spanish navy set sail toward home. But the French ships, by order of Napoleon III, began an attack. On May 5, 1862, 6000 soldiers under the commander of the French forces tried to capture the forts of Loreto and Guadalupe in Puebla de Los Angeles, Mexico. Two thousand Mexican men, led by General Ignacio Zaragoza, fought back hard and held the fort. Although smaller in number, the Mexican army won this battle but they did not win the war. The French conquered the country, and in 1864, a European emperor was put on the Mexican throne. Three years later, after a reign filled with problems, the emperor was deposed and killed. Even during the short period of French rule, the Mexicans celebrated Cinco de Mayo. They changed the name of the town where the French were defeated to Puebla de Zaragoza. Today Americans participate in activities organized for Cinco de Mayo . The Batalla de Puebla or Battle of Puebla on May 5th, symbolizes the Mexican resistance and determination to retain their independence. Cinco de Mayo has come to symbolize a commitment to fight even when the odds seem insurmountable. Cinco de Mayo is celebrated on a much larger scale in the United States than in Mexico. In Los Angeles, the celebration takes place in the streets outside City Hall where Mexican orchestras and local bands play Mexican patriotic songs. The streets are colored in green, white and red - the colors of the Mexican flag. Young boys are proud to be seen in Mexican clothing and girls wear red and green ruffled dresses with wide skirts. Famous musicians play popular and familiar tunes on their guitars while dancers spin around and click their castanets. A temporary stage at the steps of City Hall is decorated with a picture of General Zaragoza, flanked by Mexican and American flags. Mexican dignitaries are guests of honor, pleased to hear the mayor of Los Angeles making a speech in Spanish. Later, celebrants stroll through the streets to the old section of the city. Others go to city parks where sports events, dances and picnics featuring Mexican food are taking place. Fajitas from Norther Mexico es a great way to celebrate Cinco de Mayo.